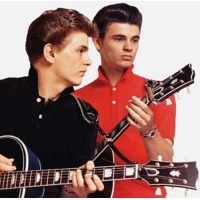 The Everly Brothers (Don and Phil, born Isaac Donald Everly, February 1, 1937, and Phillip Everly, January 19, 1939) are country-influenced rock and roll performers, known for steel-string guitar playing and close harmony singing. The brothers are the most successful U.S. rock and roll duo on the Hot 100. Their greatest period came between 1957 and 1965.